Past events that were either failures or successes formed the ground that we walk upon today. Understanding how Sci-Fi came to exist can be complicated or very simple. However, it’s imperative to know origin and history so we can find it easy to understand the position we find ourselves today. The simple way: While science fiction is deeply rooted in history, the simplest way to relate to science fiction in a way that people recognize is referring them to the stories of Utopia and Gulliver’s Travels, Frankenstein – the origins of science fiction. The more complicated way: In this wise, the history of science fiction is a graphical arrangement of events in a chronological order that shows the literary genre from its initial roots in systematic collection and study of myths and awesome stories to the post-Star Wars space epics showing today. Science Fiction can be described as the progeny of the impact that Enlightenment era and Romanticism era had when they collided together which brought about Gothic fiction which in turn birthed sci-fi, horror, crime novels, fantasy, and westerns. I’ve never thought of science fiction as a look into history. You should expand this article more, I’d love to read more on this. I’m glad you like it. I invite you to check Sci-Fi Origins. Knowing how something came about will help you understand it better. Stay tuned for more. 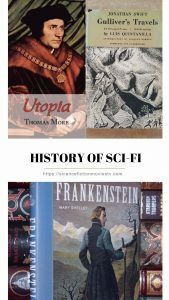 Very cool thoughts about the origins of sci-fi, and how we can all benefit from reading the sci-fi classics and tracing how they became the space and steampunk and dystopian stories we know today! Back in school, I made a paper on Frankenstein as the start point of science fiction. When I read your article on the origins of Sci-Fi I remembered all the research I did. When you look back at all the vents that happened and the changes that came because of these events, it’s a lot to take in. Thanks for the reminder! Knowing history, in general, helps you understand why we are at the place we are today. Some people tend to forget history or wish to repeat it the mistakes of the past. History is important to acknowledge all areas in life. We should strive to become better and knowledge helps us get there. With knowledge I mean actual research and use critical thinking to assess the information. Not blindly consume everything that you see.Some people underestimate science fiction and don’t take the genre seriously but there is a very rich history behind the genre most of us love. I agree with everything you mentioned. However, it seems that history is losing its value. People are making the same mistakes as before but I believe it’s because they don’t know the details and that is why they can be manipulated. This has nothing related to Sci-Fi but takes Thanksgiving for example. It is a Us celebration that has been heavily promoted and commercialized. Thanksgiving celebration has lost much of its original religious significance; instead, it now centers on cooking and sharing a bountiful meal with family and friends. But Even its significance is not entirely clear. When was it first declared and For what? The negotiation of a peace treaty between the Pilgrims 9and the Wampanoag Nation seemed to be the reason. At the end of their first year, the Pilgrims held a great feast honoring Squanto and the Wampanoags which became Thanksgiving day but word spread in England about the paradise to be found in the new world and at that time there were no fences or anything so they seized land, captured and killed many natives who fought back. You are absolutely right when you say that knowing history helps us understand why we are where we are today. we have ignored and allowed ourselves to be distracted by frivolous things.